President Obama's second daughter Sasha Obama is growing up real fast. The beautiful daughter of the former American President appears to have had a boyfriend or a good one night stand. 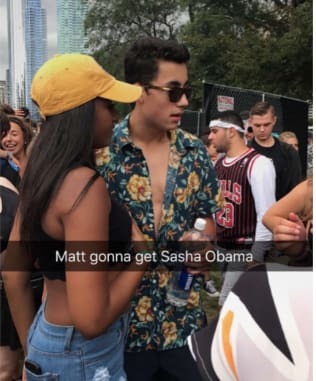 Last weekend, the 16 year old former first daughter was spotted at Lalapaloaza, a music festival in Chicago, engaging in public display of affection with 'Matt' a boy she allegedly just met. Now this is what we call love at first sight. Moments later, he (dunno why I think this taleteller is male) shared another photo of Sasha kissing Matt deeply. The two seemed engrossed in their little game of saliva exchange, oblivious of their surrounding. As the pictures continue to trend, I wish everyone a beautiful kiss like what you are about to see.